Director Eric Von Haessler spent three years looking for reasons why his favorite band, Drivin' N' Cryin', hadn't enjoyed more national success. With the help of fellow fans Peter Buck, Darius Rucker, Jason Isbell, David Lowery, Ed Roland, Ty Pennington, Blackberry Smoke, and others, he uncovers the fascinating, behind-the-scenes story of a band that has spent the last 30 years both creating great music and making questionable career moves. Along the way he finds that Drivin' N' Cryin' is a true rock & roll success. This documentary film uses album tracks and videos, never before seen performances, interviews from the past and present, along with archival behind the scenes footage to tell the true story of Drivin' N' Cryin'. It's a raw and honest look behind the curtain, warts and all. The DVD includes extras with full length live performances, new music videos, and more. 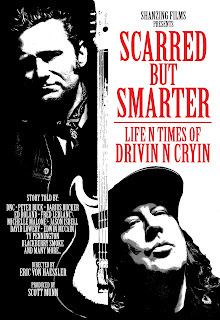 "Scarred But Smarter" features interviews and performances from Kevn Kinney, Tim Nielsen, Mac Carter, Dave V. Johnson, Paul Lenz, Jeff Sullivan, Buren Fowler, Sadler Vaden, Peter Buck, Jason Isbell, Darius Rucker, David Lowery, Ed Roland (of Collective Soul fame), Edwin McCain, Blackberry Smoke, Charlie Starr, Ty Pennington, Michelle Malone, T. Hardy Morris, and more!